Microarray or biochip is a lab-oriented microscope slide that is usually made of glass, silicon chip, or nylon membrane. It is a 2D array (sometimes 3D) whose surface is provided with thousands of minute pores in defined positions. The microarray is a recently developed technology and was discovered only two decades ago. It is mostly used in cancer research and in the pharmacological treatment of other diseases like oral lesions. It enables researchers to investigate and analyze the expression of thousands of genes in a single reaction and address various issues. This technology works under the principle of binding (also called hybridization) strands of complementary sequences of DNA (cDNA) with each other. Microarray has two broad classifications, based on its mode of preparation and on the types of probes used. The spotted array on glass: spotted arrays are arrays made on poly-lysine coated glass microscope slides. This provides binding of high-density DNA by using slotted pins. It allows fluorescent labeling of the sample. Self-assembled arrays: these are fiber optic arrays made by the deposition of DNA synthesized on small polystyrene beads. The beads are deposited on the etched ends of the array. Different DNA can be synthesized on different beads and applying a mixture of beads to the fiber optic cable will make a randomly assembled array. In-situ synthesized arrays: these arrays are made by chemical synthesis on a solid substrate. In the chemical synthesis, photolabile protecting groups are combined with photolithography to perform the action. These arrays are used in expression analysis, genotyping, and sequencing. DNA microarrays: DNA microarray is also known as gene chip, DNA chip, or biochip. It either measures DNA or uses DNA as a part of its detection system. There are four different types of DNA microarrays: cDNA microarrays, oligo DNA microarrays, BAC microarrays and SNP microarrays. MMChips: MMchip allows the integrative analysis of cross-platform and between-laboratory data. It studies interactions between DNA and protein. ChIP-chip (Chromatin immunoprecipitation (ChIP) followed by array hybridization) and ChIP-seq (ChIP followed by massively parallel sequencing) are the two techniques used. Protein microarrays: it acts as a platform for characterization of hundreds of thousands of proteins in a highly parallel way. Protein microarray is of three types, and these are analytical protein microarrays, functional protein microarrays and reverse-phase protein microarrays. Peptide microarrays: these types of arrays are used for the detailed analyses or optimization of protein–protein interactions. It helps in antibody recognition by screening proteomes. 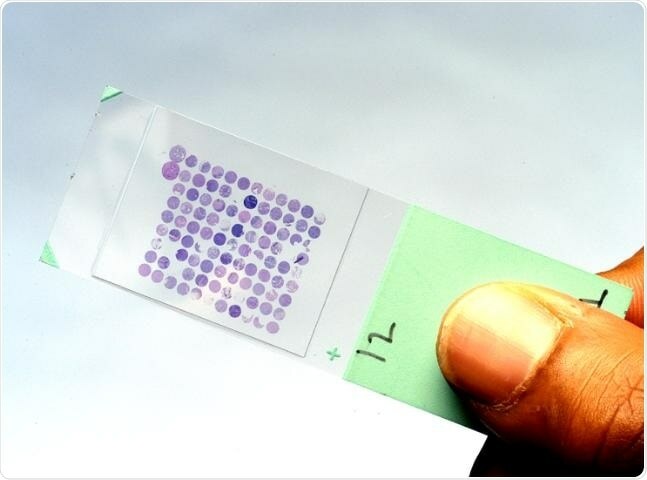 Tissue microarrays: tissue microarray paraffin blocks that are formed by separating cylindrical tissue cores from various donors and embedding it into a single microarray. This is mainly used in pathology. Cellular microarrays: they are also called transfection microarrays or living-cell-microarrays, and are used for screening large-scale chemical and genomic libraries and systematically investigating the local cellular microenvironment. Chemical compound microarrays: this is used for drug screening and drug discovery. This microarray has the capacity to identify and evaluate small molecules and so it is more useful than the other technologies used in the pharmaceutical industry. Antibody microarrays: they are also referred to as antibody array or antibody chip. These are protein-specific microarrays that contain a collection of capture antibodies placed inside a microscope slide. They are used for detecting antigens. Carbohydrate arrays: they are also called glycoarrays. Carbohydrate arrays are used in screening proteomes that are carbohydrate binding. They can also be utilized in calculating protein binding affinities and automization of solid-support synthesis for glycans. Phenotype microarrays: phenotype microarrays or PMs are mainly used in drug development. They quantitatively measure thousands of cellular phenotypes all at once. It is also used in functional genomics and toxicological testing. Reverse phase protein microarrays: they are microarrays of lysates or serum. Mostly used in clinical trials, especially in the field of cancer, they also have pharmaceutical uses. In some cases, they can also be used in the study of biomarkers. Interferometric reflectance imaging sensor or IRIS: IRIS is a biosensor that is used to analyze protein–protein, protein–DNA, and DNA–DNA interactions. It does not make use of fluorescent labels. It is made of Si/SiO2 substrates prepared by robotic spotting.